Natasha Sinha is an avid reader and by nature, a storyteller. As a dramaturg, she advocates for artists and their work through questioning, and as a producer, she looks include representative voices of -and for- our world. Focusing on new work led her to the LCT3/Lincoln Center Theater, where she is an Associate on the artistic staff. She also serves as Literary Consultant on the Advisory Board for the Musical Theatre Factory. Most recently, she moderated a panel to raise visibility for the South Asian Theater Community. This panel included a Tony award winning playwrights, directors, and actors of South Asian descent, but most importantly, drew South Asian artists from all over New York in attendance. Natasha and I sat down on a Lincoln Center rooftop to discuss her work and goals in this industry. “I always loved storytelling as a kid—via reading, writing, playing music, composing music, seeing theatre, writing long analytic epics about my thoughts on what I saw, etc. I just didn’t think someone like me (ie: a little brown girl) was supposed to dream of things like theatre. I was a total dork about it when I went to see shows and would look up who was in it, who created it, what else they made, what they’re like, etc. And tangentially to my pure interest in all of that, I sort of subconsciously and casually was translating that as “Nobody like me is really that great at this and therefore doesn’t make it, so I should instead do what I’d be great at.” So I just assumed I’d be a doctor who goes to theatre a lot. In senior year of high school, I finally admitted I would be miserable as a doctor. In addition to production, you do dramaturgy. Could you explain for the folks at home what that means? “Dramaturgy is like a running joke because the definition is so elusive. I’ve grown to love that because [the definition] bends according to the project. I heard what a dramaturg was first in college and thought, ‘OH! That’s what I could be, that’s how I could work in theatre.’ For me, since I focus on new work, dramaturgy is the work done to more fully realize and clarify the generative artists’ goals, and to connect it to the world around us. Mostly via questions. New work has always been my focus in theatre... I bring that perspective to the dramaturgy collective I co-founded (Beehive Dramaturgy Studio), I moderate Musical Theatre Factory’s People of Color Representation Roundtable downtown that’s comprised of mostly generative artists, I work on a freelance basis to help exciting writers develop their work, I curate events to boost visibility for underrepresented voices so that they’re more part of the conversation and can hopefully get more attention and find more advocates, etc. As a dramaturg, I’m looking to ask questions that reflect what an audience member might be thinking, while keeping in mind the generative artists’ intentions. Advocating for the artists’ goals and challenging them to go deeper and consider connections I might pick up on (from my more distant position in the process) is so exciting." If dramaturgy is all about asking questions, how does that influence the questions you ask wearing your producer hat? “I guess for me, they’re tangled up in one another, though producing means I can translate what I know of the writers and the piece to many other elements of putting the show up… My choices along the way of producing a work are driven by what’s necessary and thrilling for the storytelling, and how to use limited resources in as savvy a way as possible toward those core needs. How do we most smartly connect these resources to this story? What’s most important in terms of the goals for the story? How can we anticipate that? How can we keep in mind all past solutions to obstacles while also remaining open to new kinds of problem-solving? What are some creative solutions to one problem that would allow more resources to flow to a second problem that is perhaps more deeply-rooted to the core of the show? You’ve done a lot of new work at LCT3, Musical Theatre Factory, etc. What drew you to new work years ago, and what keeps you tethered to it now? “My entry point to theatre was through big Golden Age musicals, which are sort of the opposite of what I work on now. I still love many of those, but—again I don’t think this was a conscious choice at the beginning—I think I was most drawn to new work (once I realized that existed) because I felt like so many voices were left out. Working at a theater that has some reach and that focuses on bringing in new voices means I can be part of creating a more inclusive canon for the future and amplify talented voices now. That’s probably not what I would’ve said years ago—I probably would’ve said, ‘Well, I just like working with writers and these ones are alive!’ but I look back at all that and I was always drawn to the kinds of people whose voices and stories and perspectives I DIDN’T hear from growing up. They were and are grappling with things that are very much alive. In the trash fire of America right now, there’s so much to address, and it’s important to me to center those problems and difficult truths and complex ideas through a specific dramatic lens. Omission—whether passive or active-- has always been something that weighs heavily on me. Its power is scary. I think, for me, theatre is a really visceral way to show stories that combat that... to choose who to put in the spotlight and present to crowds and crowds of people. I waver on whether theatre can change the world, but I do think it can change or add to someone’s mindset, which might shift how that person sees things when they’re thrust into the world later on, in some direct or indirect way. Let’s talk about the South Asian Theater Panel! We know who, what, and where. Why do it now? “I wanted to do a panel and mixer of all South Asian theatre folks for years, actually. But when I talked to Arpita Mukherjee about how Tamasha was joining forces with a bunch of theatre companies this year, I thought, ‘I can finally do this, and with this great other company too!’ So it’s always felt necessary. But in this year, in this moment in time, it’s of course extra important to see varied communities and most importantly to me, the diversity within each community. The range of styles. The specificity. The myriad perspectives. I find these days that conversations about plays by/about people of color are primarily identified by demographic and associated characteristics, whereas those by/about white folks are about the nuances of the work itself. But, obviously, we are all different even though we share the umbrella of “South Asian,” for example. That’s why I wanted that panel to be six people (all of whom are in the theatre community, in varying roles), who in many ways have different experiences, different perspectives on theatre, etc. I wanted to show all we’re missing out not only by not having a South Asian slot in some slate of programming, but also all we’re missing out by not doing enough work by South Asian folks (and other people of color, and basically anyone who isn’t a cis white man) when there’s only a single representative of an entire community. That’s just so limiting and theatre could be so much richer! Are there plans to do it again and/or grow it into something bigger? How do you feel South Asian representation and inclusion can grow? What is the next step? “To increase visibility of South Asian artists at every level, and also the range of what they do within theatre. Not just actors getting called in to play deli owners, cabbies and terrorists. Not just playwrights who have to conform to what those in power think a story by a South Asian artist has to be. Not being satisfied by knowing one or two theatre artists per role and calling it a day. 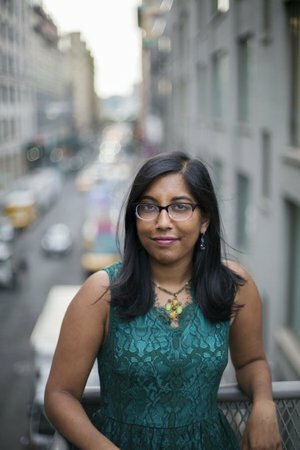 For example, it would be awesome to have a season in NYC where we got to see full productions of plays by folks like Madhuri Shekar and Dipika Guha and Deepa Purohit… all South Asian female playwrights but each doing such different things in terms of style and subject matter and perspective. “Ahh, if the musical is doing what it wants to do, I think it’s legitimately awesome, even if it may seem silly! I guess XANADU comes to mind first for some reason? It’s hilarious and well-written and ridiculous and witty and doing exactly what it wants to do. SO fun. A musical I loved from about 15 years ago was TABOO, which had a surprisingly precise and gorgeous score by Boy George, and killer performances. It only ran a couple months, but it was a musical about thoughtful misfits finding a community… so I related!